Lisa N. Peters, John Henry Twachtman: An American Impressionist, exh. cat. (Atlanta: High Museum of Art, 1999), 111. Twachtman to Julian Alden Weir, December 16, 1891, quoted in Kathleen Pyne, “John Twachtman and the Therapeutic Landscape,” in John Twachtman: Connecticut Landscapes, Deborah Chotener, Lisa N. Peters, Kathleen A. Pyne, eds., exh. cat. (Washington: National Gallery of Art, 1989), 53. “Around the Galleries,” The Sun (New York), March 6, 1901, 6. Twachtman also had an important legacy as a teacher, particularly at the Art Students League in New York, where he taught from 1889 until his death in 1902. He encouraged his students to avoid the literal transcription of nature and eliminate excess detail and hackneyed academic formulas. Though he died in 1902, eleven years before the Armory Show, the organizers of the exhibition recognized him as an important artist whose work had contributed to the development of American modernism. Richard J. Boyle. John Twachtman (New York: Watson Guptill, 1979), 13-15. 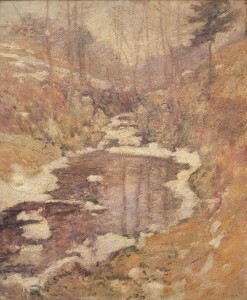 Lisa N. Peters, John Henry Twachtman: An American Impressionist, exh. cat. (Atlanta: High Museum of Art, 1999), 97. Kathleen Pyne, “John Twachtman and the Therapeutic Landscape,” in John Twachtman: Connecticut Landscapes, Deborah Chotener, Lisa N. Peters, Kathleen A. Pyne, eds., exh. cat. (Washington: National Gallery of Art, 1989), 53.